I want to make sure you have all the information. Here are the benefits of choosing myself as your home inspector. Nampa Idaho is a growing area and fast becoming one of the best places to find great value on homes. With an abundance of strong businesses the city is now the fastest and largest city in Canyon County Idaho. The close proximity to major interstate freeways and businesses offer great access points for local business in Nampa as well as residents who need to commute to either Meridian or Boise. Finding the right home in Nampa, ID is a very exciting but also stressful time. Every home will be different, and remember no home is perfect. This is why you do not need just a home inspector, but a home inspector that will be there on your side using the very latest tools and information provided in the home inspection industry to help make your home buying process easier. 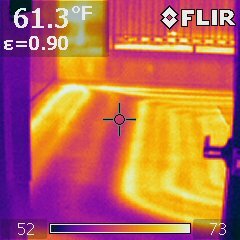 Your home inspector needs to not only be certified with a National Organization, but also should be using Thermal Infrared Imaging and moisture detection devices as part of every home inspection they perform. 7 County Home Inspection, LLC has been using this technology for years, not weeks, not months, but years. We are also certified in Thermal Infrared Technology. I also offer full moisture testing services in the areas of Exterior and Interior non-visble walls and ceilings. Invasive moisture testing is the only way to surely know if and how much moisture is in the home you are thinking of buying if there is evidence of staining or detected with the thermal infrared camera. Save a little and spend a lot later, or go with a full inspection service company and know exactly what you are buying. Why get an inferior inspection! If you are in need of hiring a Nampa home inspector, call us @ 208-880-7816. I look forward to meeting and helping you!